Матрица 13488/3п, Г-117, пластинка изготовлена после 1950 г.
Gramophone Co. > Concert (Angel) 22821 573x First edition?? 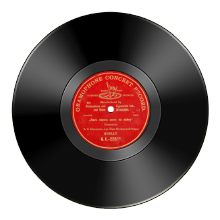 Gramophone Co. > Concert (Angel) 22821 573x First edition. Large flush label, Reproduced in Hanover, No angel logo on back.